The only sodium and potassium balanced hyperacidity formula that is calcium free. 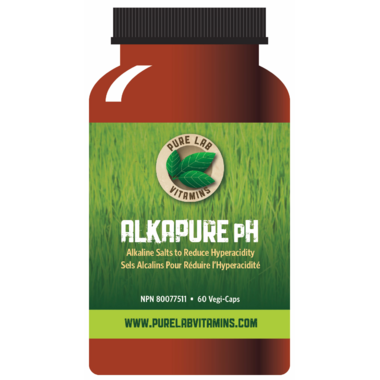 AlkaPure contains the two components that the body naturally uses to balance acidity - and it helps replenish the body’s alkaline reservoirs. Dosage: Take 1 capsule twice daily or as directed by your health care practitioner. Avoid taking medications within 2 hours before and after taking this product. Caution: Individuals with kidney disease should not take this product except on the advice of their health care practitioner. I used to take Prevacid for years. This product totally changed my body and in such a great way. It really works and it works so well... would suggest to anyone with high levels of stomach acid, acid reflux, indigestion, etc. Such an amazing product by an amazing brand! It helped everytime I had acidic stomach!! It worked every time I had acidic stomach!! Worked better than my prescription has since Feb. Took them 2 days and heartburn was gone!! !